Marie Gaspari-Crawford stands in the doorway of her outdoor office, the breeze rustling her hair as she looks out at her ranch. There are rows of leashes hanging from one wall and a freezer full of frozen animal food, but none of this equipment or food is for her dogs. It’s all for her nearly ten falcons and hawks. 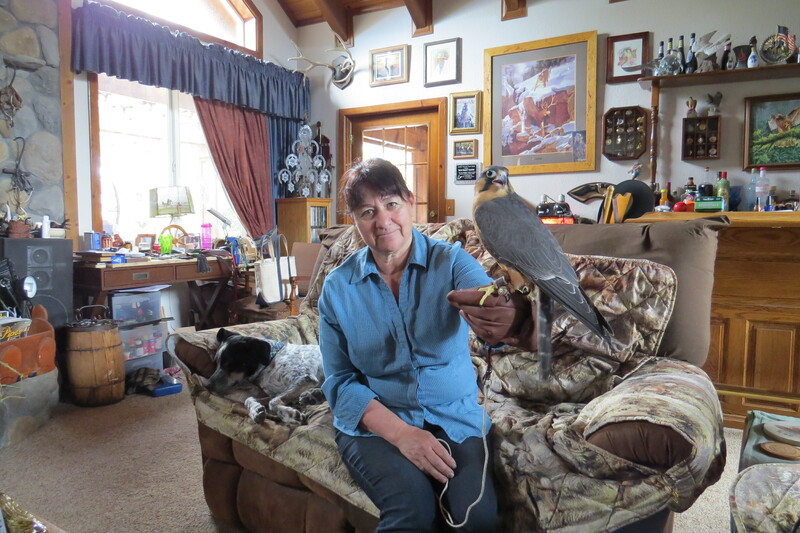 Gaspari-Crawford is one of 63 falconers in Nevada. She’s a Master Falconer, which means she can train apprentice falconers hoping to also get their license. She decided to become a falconer 16 years ago. “Falconry is just another way of hunting,” Gaspari-Crawford says. “It’s like bow hunting is another way of hunting versus shotguns or rifles.” It’s also a more challenging way of hunting, which Gaspari-Crawford says she enjoys. Raised in a Nevada ranching family, Gaspari-Crawford had no hesitations about pursuing a sport full of life and death. In addition to hunting, falcons and hawks are subject to a myriad of diseases and injuries that may result in an untimely death for the bird. “When you’ve worked with a bird for seven or eight months and you’ve put your heart in it, and you watch it died in your hands, it is truly heart breaking,” Gaspari-Crawford says. As a falconer, Gaspari-Crawford also acts as a “bird dog” for her falcon or hawk during the hunting process, retrieving whatever game her bird is able to catch. Often, this requires Gaspari-Crawford to kill whatever animal is caught. While ending lives may be part of her duties as a hunter, her job as a falcon breeder is focused on preservation. “I truly believe [falcons] are amazing and I believe they serve a very vital part in our world and that we should make sure that they sustain their numbers throughout the future,” she says. Gaspari-Crawford remembers when the Peregrine Falcon was considered an endangered species in the 1970s. According to the U.S. Fish and Wildlife Service, there were only 324 known breeding pairs of Peregrine Falcons in 1975. Falcon breeders stepped in and increased that number to roughly 3,000 breeding pairs by 2013. Some of those same breeders also went to Peru and Mexico and trapped Aplomado Falcons, bringing them to the United States. Gaspari-Crawford says she was lucky enough to receive one of those falcons. Eventually, she also acquired a male Aplomado Falcon, which she wanted so she and her husband could hunt together with the Aplomados. She didn’t expect the male and female Aplomado to breed; it can be a tricky process. She was shocked when the two laid eggs and she decided to go along with it. This year, she raised three falcons and decided to sell them to abatement falconers, becoming a breeder herself. Abatement falconers are used to chase away other pesky birds from vineyards, farms and restaurants. Birds of prey are also used places like the Cannes Film Festival, where hawks keep seagulls away from celebrities. Many airports also hire falconers and their birds to keep other birds from flying near the engines of airplanes. Gaspari-Crawford checks on her falcons daily. Sometimes, it can take as long as three hours to care for all of them. Photo by: Natalie Van Hoozer. Gaspari-Crawford says falcons and falconers are often misunderstood, so she likes to hold educational talks to teach people about the different uses for falcons and hawks. Gaspari-Crawford takes her birds along with her to these presentations in order to increase awareness of these birds and to reinforce their value to society. The term “falconer” is often used broadly to refer to the bird handlers of falcons and hawks, but for master falconer Marie Gaspari-Crawford, the two types of birds could not be more different. “The falcons are more the Lamborghini of the bird world, and hawks are more like the Chevy pickup truck,” says Gaspari-Crawford. Both breeds are considered birds of prey, but their performance styles vary: “You can hunt both, you can dive both, one’s just a little bit more fancy than the other,” Gaspari-Crawford said. Fun fact: The “bald eagle screech” heard on television? It’s actually the call of a Red-Tailed Hawk.